Entrance to the villa is via the main double-storey building, from a smart private parking area. Occupying the top floor of this building are two bedrooms, both opening onto the attractively planted roof terrace with large sunken jacuzzi and sun loungers set on honey-hued decking. A third bedroom lies on the ground floor next to the exceptionally well-equipped entertainment room. A wing to the right of the entrance houses the guest and staff kitchens, and at the centre of the property is the delightful open-sided living and dining pavilion and infinity pool. The two-bedroomed guesthouse, with a further living and dining area, is set on a lower terrace of the large gardens. In the large entertainment room on the ground floor of the main building is a saloon-style snooker table, large plasma screen TV and massive corner lounge suite piled with colourful cushions to create the perfect home cinema. Glass doors wrap the stylish guest kitchen, which is fitted with a marble-topped island counter and equipped with a built-in pizza oven. Wooden panels conceal cupboards stocked with modern kitchen appliances, board games and children’s books. Steps lead down to the open-sided living pavilion at the centre of the villa.Smart sofa seating frames all four sides of the spacious, sunken lounge at the centre of which are two pale wood coffee tables. Ceiling fans keep things cool and a large plasma screen TV provides entertainment. This open-sided lounge is protected from inclement weather with remote-controlled blinds. In the dining area, a honey-coloured rustic wooden table seats 12, illuminated by copper lanterns dangling seductively from the ceiling. Bar stools pull up to the wooden bar counter and an iMac is available for guests to access high speed internet and the in-house play list piped through the villa via Bose speakers. The Iman is fitted with Apple TV throughout. In the guesthouse, which is set to one side of the garden, an open-plan fan-cooled living, dining and kitchen space is furnished with a square table seating eight, and a lounge suite facing the wall-mounted TV. The neat kitchen is fitted with a stove hob, sink and fridge. Steps from the living pavilion lead to a stone deck and four sunbrella-shaded loungers. The 21-metre swimming pool projects out over the lower garden, and little ones will love splashing about in the adjoining wading pool. The rooftop terrace, accessed from the two upper-floor bedrooms, features a large pond surrounded by plants which creates an ‘eco roof’ above the living area. Extensive southerly views across Bali’s forested plains can be enjoyed from the terrace’s all-weather sofas or from the depths of the stone jacuzzi just beyond the master bedroom. 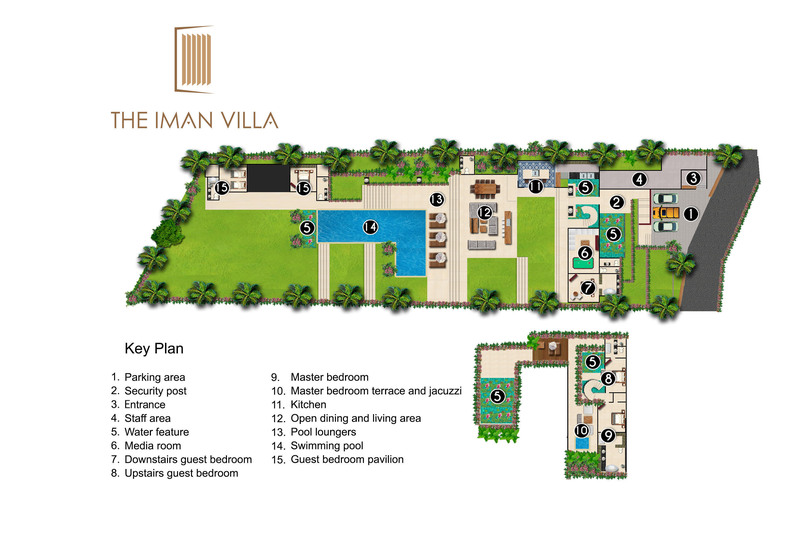 The Iman Villa’s five air-conditioned ensuite bedrooms each have king-size beds (one convertible to twins) piled high with cushions to complement individual colour schemes. All are equipped with TV/DVD players, copper bedside lanterns and built-in wardrobes neatly hidden behind wooden panels. Extensive windows create bright spaces and sunny outlooks. The master bedroom is on the top floor of the main building with sloping walls and floor-to-ceiling windows revealing 180-degree views. Sliding doors open onto the roof terrace with outdoor lounge suite and sunken jacuzzi. A large bathroom incorporates a walk-in dressing room, freestanding tub, walk-in shower and window seat. Bedroom two, neighbouring the master, is equally suited to kids or adults, with cheerful green soft furnishings and long window seat. Like the master, it also opens on to the rooftop terrace. This room’s ensuite bathroom is fitted with a rain shower. Bedroom three is on the ground floor of the main building, with vibrant turquoise soft furnishings, carved wooden decorative wall panels and latticed occasional chairs. Glass sliding doors open onto the lawn. The bathroom has a walk-in shower and a freestanding bath tub overlooking a courtyard garden. Both guesthouse bedrooms open onto an expansive stretch of lawn with views out to the rice fields. Bedroom four has apricot pink soft furnishings, built-in wardrobes and ensuite with shower. Bedroom five is slightly larger with white and beige furnishings and a daybed tucked into an alcove. The king-size bed in this room can convert to twins. The bathroom features a sunken tub with shower.